Bautch, Richard J., and Mark Lackowski (eds.) (2019). On Dating Biblical Texts to the Persian Period. Mohr Siebrek Ek. In the last two decades, increasing numbers of texts have been suggested as coming from or edited during the Persian period, but these discussions do not always reflect extensively on the assumptions used in making these claims or the implications on a broader scale. Earlier generations of scholars found it sufficient to categorize material in the biblical books simply as “late” or “postexilic” without adequately trying to determine when, by whom, and why the material was incorporated into the text at a fixed point in the Persian period. By grappling with these questions, the essays in this volume evince a greater degree of precision vis-a-vis dating and historical context. The authors introduce the designations early Persian, middle Persian, and late Persian in their textual analysis, and collectively they take significant steps toward developing criteria for locating a biblical text within the Persian period. 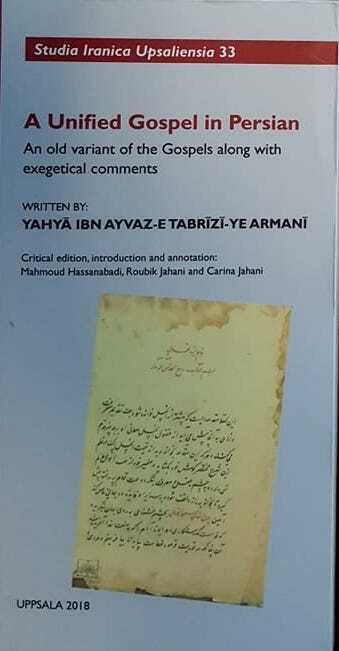 Hassanabadi, Mahmoud, Carina Jahani & Robert Crellin (eds.). 2018. A Unified Gospel in Persian: An old variant of the Gospels along with exegetical comments by Yahyā Ibn Ayvaz-e Tabrīzī-ye Armanī (Studia Iranica Upsaliensia 33). Uppsala: Acta Universitatis Upsaliensis. Today we are accustomed to thinking of the Bible as a single entity, i.e. as ‘the Bible’, a well-defined corpus containing a set number of books. In late antiquity and in the Middle Ages, however, the situation was much more fluid. This fluidity showed itself not only in the fact that parts of the Bible would often circulate independently, but also in that Bible texts were often known in vernacular languages both in direct translations, but also in interlinear glosses and poetic paraphrases. It is in this context that the Unified Gospel is to be seen. Unifications of the gospel texts are often called Diatessaron (through the four), and, although this name has not been used for the Persian text presented in this book, it can still be seen as belonging to the Diatessaron tradition. The Unified Gospel presented here was compiled in Persian by a certain Armenian who calls himself Yahyā Ibn Ayvaz-e Tabrīzī-ye Armanī. The actual time of the compilation cannot be determined from the existing manuscripts. The main manuscript for this edition is kept in the National Library and Archives of Iran. It was finalized on 9 Rajab 1111 A.H. (corresponding to 31 Dec. 1699) by a scribe named Khusraw, son of Bahrām. Other manuscripts, which are introduced in detail in the Persian introduction, have also been taken into account in this edition. In addition to the actual Gospel texts, there are numerous exegetical comments by the compiler, which are of great value for a deeper understanding of how the text was interpreted in former times. The language also shows certain archaic features, both in the vocabulary and the syntax, which indicate that the original work most likely dates to pre-Safavid times. It is not entirely clear for whom this Unified Gospel in Persian was produced. The compiler finds that the people of his time had turned away from God and instead sought worldly affairs, spending their time reading stories and poems full of deceit and darkness instead of reading the Gospel. The Gospel was not available to them in Persian, a language of which they had better knowledge than the languages into which the Gospels had already been translated. This was the reason why the compiler/translator undertook the work which resulted in the present manuscript, which is particularly valuable due to the large number of comments to the Bible text added by the compiler. Noonan, Benjamin J. 2018. A (new) Old Iranian etymology for Biblical Aramaic אֲדַרְגָּזַר‬‎. Aramaic Studies 16(1): 10 – 19. Despite the many advances that have taken place in our understanding of the Hebrew Bible’s Old Iranian terminology, the donor terms of several words have remained elusive. Among them is Biblical Aramaic ‮אֲדַרְגָּזַר‬‎ (Dan. 3:2–3). Proposed Old Iranian etymologies for this word suffer from various phonological and semantic difficulties, rendering them unlikely. This paper proposes that Biblical Aramaic ‮אֲדַרְגָּזַר‬‎ is best derived from *ādrangāžara- ‘announcer of financial obligation’, a compound of *ādranga- ‘financial obligation’ and *āžara- ‘announcer’. A derivation from Old Iranian *ādrangāžara- adequately explains the form of Biblical Aramaic ‮אֲדַרְגָּזַר‬‎. Furthermore, this etymology also suits the context well in that ‮אֲדַרְגָּזַר‬‎ occurs just prior to ‮גְּדָבַר‬‎ ‘treasurer’ and therefore falls logically within the progression from political administration to finances to law evident in the lists of Nebuchadnezzar’s officials (Dan. 3:2–3). The Pahlavi Psalter. Ps 5 recto: Psalms 121 (opening is missing) and 122; discovered at Bulayïq/ Turfan oasis. Pehlivanian, Meliné, Christoph Rauch & Ronny Vollandt (eds.). 2016. Orientalische Bibelhandschriften aus der Staatsbibliothek zu Berlin – PK. Eine illustrierte Geschichte. Wiesbaden: Reichert Verlag. The volume presents an illustrated history of the Oriental Bible Manuscripts from the Staatsbibliothek zu Berlin. It includes discriptions of the manuscripts which are among the oldest and most fascinating items in the Oriental Collection of the State Library of Berlin. The overwhelming majority of the manuscripts presented here come from the very cradle of the Abrahamic religions. The texts range across more than 1,500 years of Christian and Jewish history in the Near and Middle East and Africa, from Late Antiquity to the 19th century. traces in the Islamic tradition. Another concern of the volume is to allow readers insights into the extremely extensive and varied collection of Oriental manuscripts in the Staatsbibliothek zu Berlin, whose outstanding treasures are in many cases only known to specialists in the field. The biblical texts, written on leather, parchment, papyrus, and paper bear witness not only to the complexity of the religious and theological traditions, but also impressively document the diversity of materials to be found in the Oriental manuscript culture, and not least the artistic achievements of the “Peoples of the Book”. Desmond Durkin-Meisterernst: “A Middle Persian Pahlavi Psalter-Fragment in the Berlin Turfan Collection” (pp. 114-116). Simone-Christiane Raschmann: “Christian Texts from Central Asia in the Berlin Turfan Collection” (pp. 105-113). Friederike Weis: “Illustrated Persian Tales of the Prophets (Qis.as. al-anbiyāʾ) (pp. 163-172). Bautch, Richard J. & Gary N. Knoppers (eds.). 2015. Covenant in the Persian Period: from Genesis to Chronicles. Winona Lake, Indiana: Eisenbrauns. The 22 essays in this new and comprehensive study explore how notions of covenant, especially the Sinaitic covenant, flourished during the Neo-Babylonian, Persian, and early Hellenistic periods. Following the upheaval of the Davidic monarchy, the temple’s destruction, the disenfranchisement of the Jerusalem priesthood, the deportation of Judeans to other lands, the struggles of Judeans who remained in the land, and the limited returns of some Judean groups from exile, the covenant motif proved to be an increasingly influential symbol in Judean intellectual life. The contributors to this volume, drawn from many different countries including Canada, Germany, Israel, South Africa, Switzerland, and the United States, document how Judean writers working within historiographic, Levitical, prophetic, priestly, and sapiential circles creatively reworked older notions of covenant to invent a new way of understanding this idea. These writers examine how new conceptions of the covenant made between YHWH and Israel at Mt. Sinai play a significant role in the process of early Jewish identity formation. Others focus on how transformations in the Abrahamic, Davidic, and Priestly covenants responded to cultural changes within Judean society, both in the homeland and in the diaspora. Cumulatively, the studies of biblical writings, from Genesis to Chronicles, demonstrate how Jewish literature in this period developed a striking diversity of ideas related to covenantal themes. Fitzpatrick-McKinley, A. (ed.). (2015). Assessing Biblical and Classical Sources for the Reconstruction of Persian Influence, History and Culture. Classica et Orientalia 10. Wiesbaden: Harrassowitz Verlag. This volume brings together the views of biblical scholars, Achaemenid historians and classicists in relation to the problems of reconstructing the history of the Persian empire. It addresses the ways in which scholars of each of these disciplines have struggled with the complexity and limitations of the ancient sources. Some of the essays in this volume discuss issues surrounding the identification of authorial biases and evaluate what – if anything – remains as possible ‘historical’ evidence, while others examine the scholarly consensus on the question of Persian policy on the religion and laws of its subjects. What unites the essays in this volume is the commitment of their authors to recognise the difficulties with the sources and to constantly engage in new appraisals of them in dialogue with scholars in their own fields, but also in dialogue with scholars in related fields. For more information, see the Table of Contents of this volume.